Today ten of us traveled to Springfield, IL, to search for Lincoln! Actually, we went to the Lincoln Presidential Museum. WOW! It was great. I would encourage everyone to make the trip to Springfield. 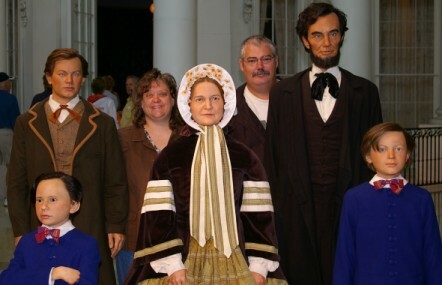 There are many other Lincoln sites to visit in Springfield to enhance the trip. Lincoln’s home and tomb, plus both the old and current state capitals are located in Springfield. Lincoln was a president who took a stand on an issue and did not budge. This strong stance caused many people to hate Lincoln. The museum portrays this through the numerous politcal cartoons that showed this hatred. Lincoln did what he believed to be the right thing to do, whether it was popular or not. This reminds me of church leaders. Elders and evangelists have to take strong stands on the Gospel and these may not always be the most popular positions. But if we are standing on the solid rock of Jesus and His Word, we have to stand firm! I pray that the elders at South Side will continue to always stand firm on the Solid Rock, popular or not! It is not the goal of the church to be popular! It is the goal of the church to be faithful. May we continue to contend for the faith that was once delivered! It thrills me that Lincoln was immersed into Christ to have his sins forgiven! There is a tradition among Illinois Disciples that John O’Kane, when state evangelist, discussed the state of Lincoln’s soul with him on several occasions; finally he was convicted and wished to be immersed. He reportedly knew that his wife, who had strong Episcopal and Presbyterian social obligations in Springfield, would be greatly embarrassed if it were known that a “Campbellite” evangelist had baptized him. But one night, Lincoln slipped away from the house with proper garments for baptism, met O’Kane and was immersed in the waters of the Sangamon River. Christians Only: A History of the Restoration Movement by James DeForest Murch, p. 155, Standard Publishing, 1962.